Our latest responsive magazine theme showcases just one way to utilize the awesome power of the Sharp Magazine. Don’t let the demo content fool you as this theme was designed and developed for a variety of content sites with sophisticated needs. As usual, a Gabfire theme is never complete until it addresses the full gamut of features being requested by leading media outlets. Whether you’re running sites with millions of unique visitors or about to launch the next big media site, check out the industry’s leading WordPress themes for online newspapers and magazines. The Sharp Magazine WordPress theme features a clean design with ample use of white space to allow your content and images to shine. 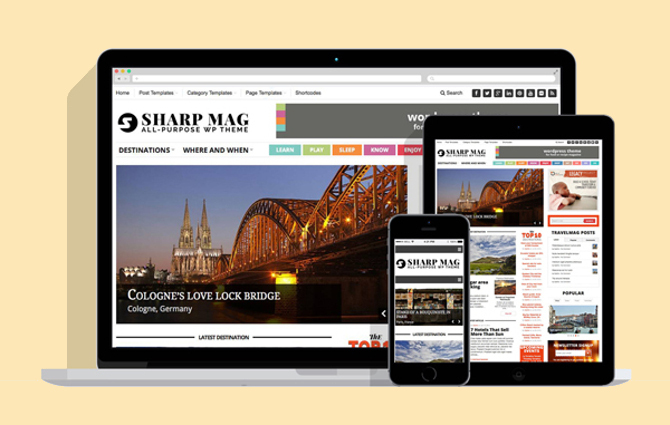 Similar to StyleBook and our recent themes, the Sharp Magazine theme is completely responsive. Given the number of layouts possible, this was no easy task but well worth the effort. Now, your site will look great on any device. Are you planning to add an online store to your WordPress website while running an awesome magazine theme? No worries any further. We took a major step forward and included support and custom styling for the most popular e-commmerce plugin, WooCommmerce. Grab your visitors’ attention with a homepage filled with various content areas. From the sleek featured slider to stylish layouts, readers won’t miss your articles. Given the hundreds of possibilities with all these templates, your site will seem uber professional and run by an army of website wizards. Seriously, this theme is loaded with custom templates that will make visitors think there’s an entire design and development team behind the scenes. Luckily, you have the Gabfire team to provide support and answer any questions all for one low price. Check out each template on the demo. There are dozens of additional options worth mentioning, but it may be easier to see them for yourself by clicking through the demo or try it out on the Playground. Extend your site further by adding widgets from our free plugin – Gabfire Widget Pack – which just surpassed 10,000+ downloads on the WordPress plugin repository. With a focus on extremely flexible layouts, clean typography, and ease of use — Sharp Magazine is the only WordPress magazine theme needed to power your website. Comments and feedback appreciated below. What do you think of this release? 23 Responses to "Sharp Magazine – Responsive WordPress Theme Release"
Looks great. When will it be available in the test environment? Just bought your Stylebook theme last Feb 11 and the purchased file came with a wp38 patch file. How/where do I use that? Do not use the patch file Winona. We will remove it from our download server. Sorry for the confusion. What a smashing looking theme, love the colours, excellent work once again!! I like the colors, middle bar in different color separates main area and side bar very clearly; this is what i like the most. Mehmet, another nice theme to see here. It’s a great theme and I have migrated all my content to the new theme. See http://www.fethiyetimes.com for the result! Make some kind of “mega menu” plug in working with your themes !!! Definitely a good suggestion, we’ll look into this thanks! Sharp is a responsive theme. It will display a suitable layout on Android / iOS devices. before i buy i would like to ask if you theme support RTL ( for arabic Language ) ? Thank you for short replay. We do have support of RTL with advanced newspaper theme only.